A hearty splash of white wine. About 2 ounces. 8 oz of any flat, long type of pasta. 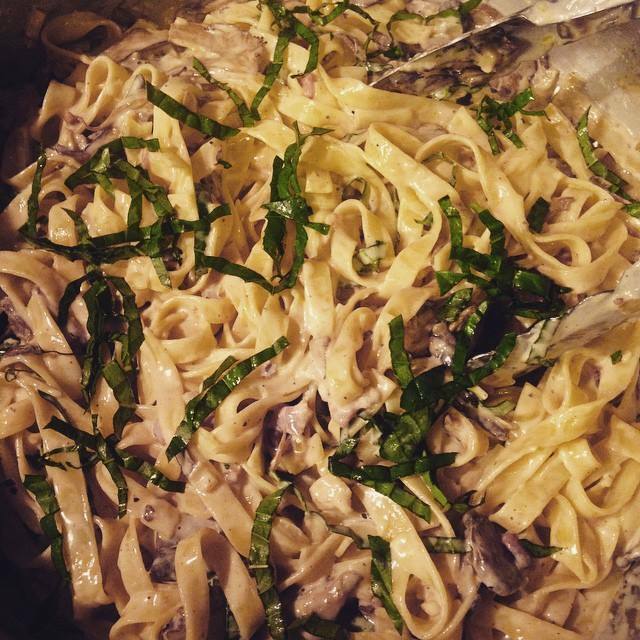 Linguine, tagliatelle, etc. 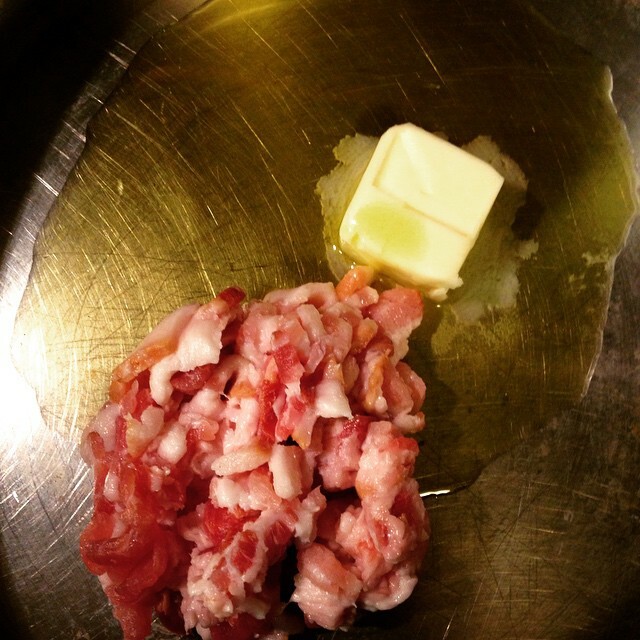 What you’ll do: Start by putting the butter, olive oil and bacon in a large, deep pan over medium-high heat. Sauté until bacon is cooked, but before it’s crispy. Don’t worry, you’ll crisp it up later. Right now, you’re just trying to render out the bacon fat. 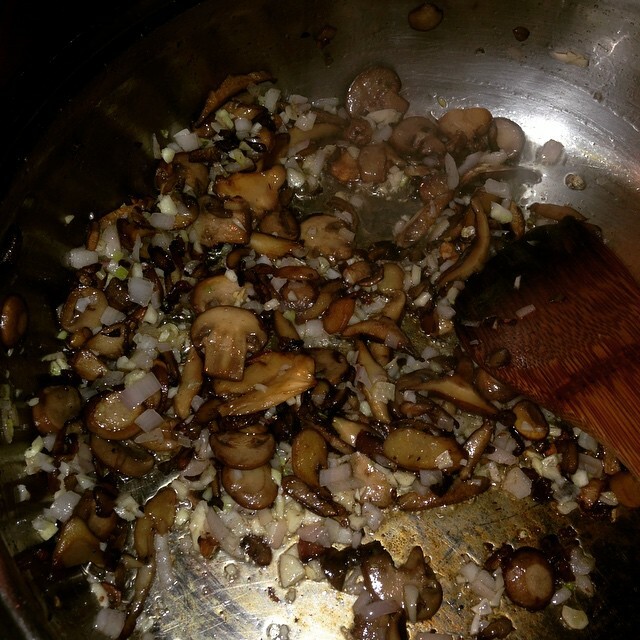 Once the bacon bits are out of the pan, sauté your mushrooms very, very well. 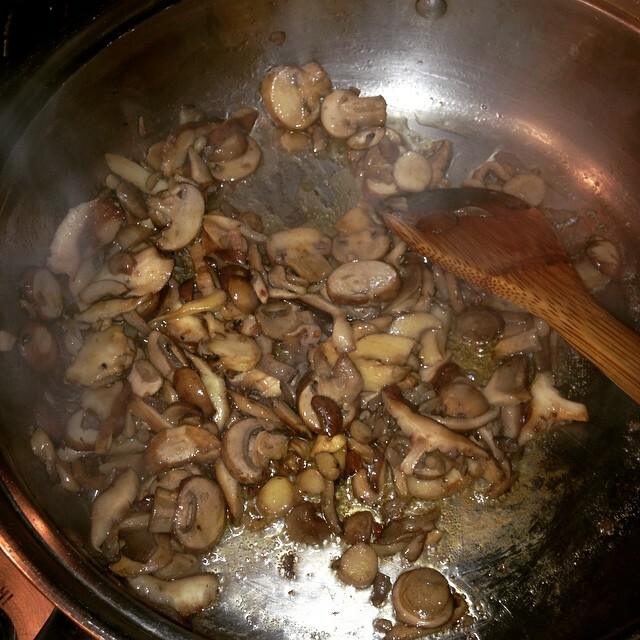 As in, you’ll want to cook them until most of the juice from the mushrooms evaporates. This gets them nice and caramelized. At this point, add the bacon back to the pan, as well as the shallots and garlic. Continue cooking for exactly until the shallots are translucent and bacon just starts to crisp. Keep a close eye on the pan, because you don’t want the garlic and bacon to burn. Next add the wine, scraping the brown bits from the bottom of the pan. And let reduce for a minute. Then add your cream, bring to a mild boil and reduce heat to low and cover so the sauce can thicken while you cook your noodles. Next, add parmesan plus salt and pepper, to taste. Careful on the salt. 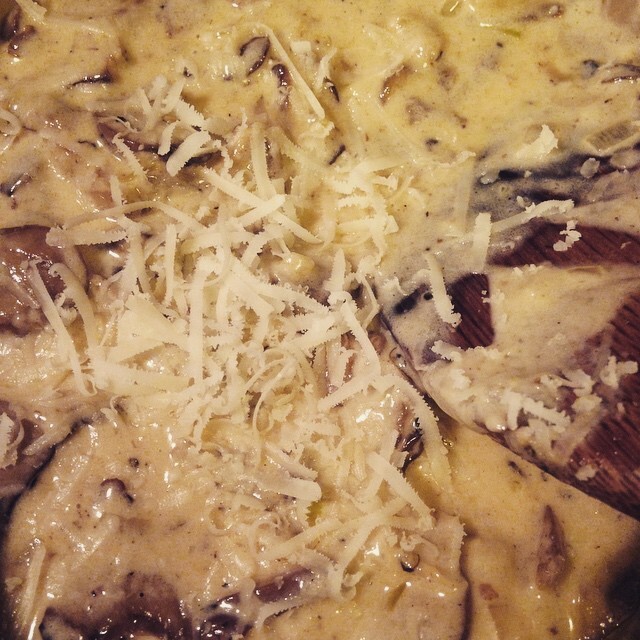 The parmesan will add a salty element in and of itself. 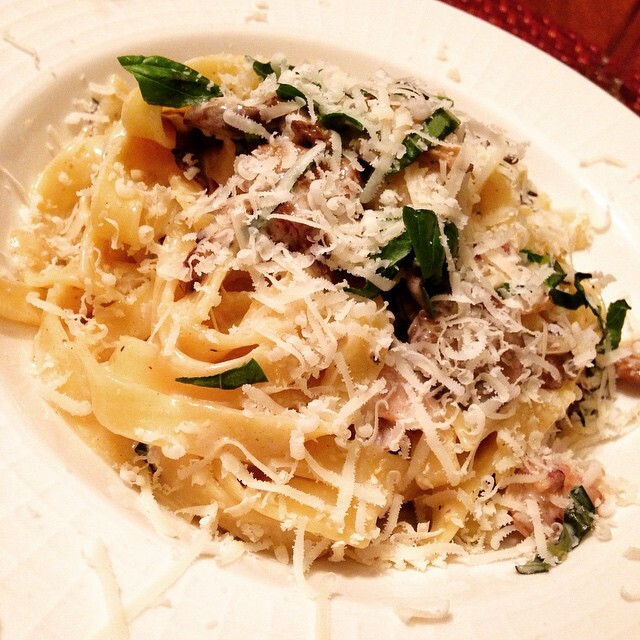 Finally toss your noodles and basil into the sauce. Now, this is so important: don’t pour your pasta water down the drain. You just might need it. Use tongs to transfer the pasta from the boiling water instead of draining in a colander. 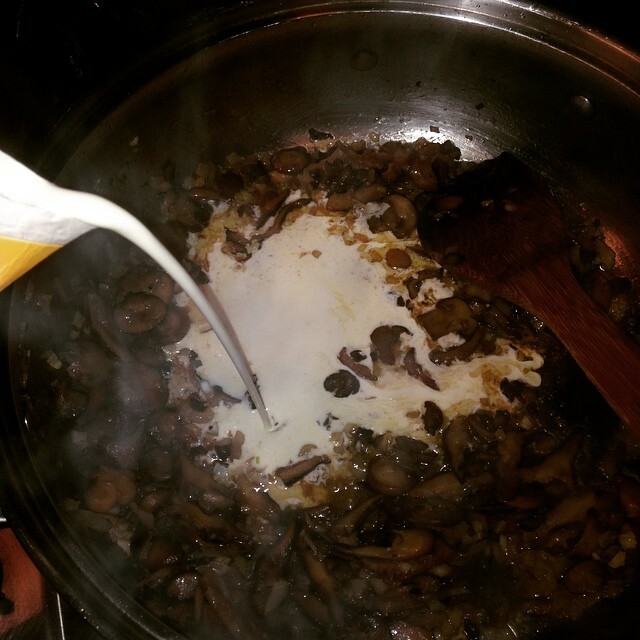 Now, if your sauce is a little too thick, here’s where that hot pasta water comes in handy: ladle a couple of spoonfuls into the mixture, and it will thin the sauce, keeping in mind a little bit goes a long way. The starch and salt of the pasta water will thin sauce without making it too thin and diluting the flavor. This was so, so delicious! And I cannot tell you enough how easy it was, and it could easily be disguised as something from your favorite Italian bistro. Give it a try and tell me what you think!